Omega Invasion in Handyman Tagaytay! 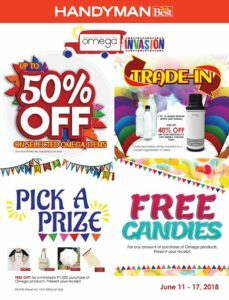 | Much Prosperity Trading International Inc.
Omega Invasion in Handyman Tagaytay! It’s time to fill your home with Omega Houseware products, Handyman shoppers! Enjoy up to 50% OFF on selected Omega Houseware items when you shop in Handyman Tagaytay from June 11 to 17, 2018. Plus, amazing freebies and awesome deals await you.